I’m sitting in my kitchen warm and toasty looking out on the garden and the Atlantic Ocean beyond while contemplating the trees and bushes with the last of their autumn colours dropping gracefully to the ground; the leaves seem to have stayed around longer than usual which adds to the rich beauty of the morning as the air seems to dance with wisps of fog in the most magical way. It’s the perfect morning to write, sitting here sipping on a soothing cup of coffee while my mind flits through the many recipes enjoyed by people past, and who recently stayed at Clifton House, and of their usual departing request to please send the recipe. 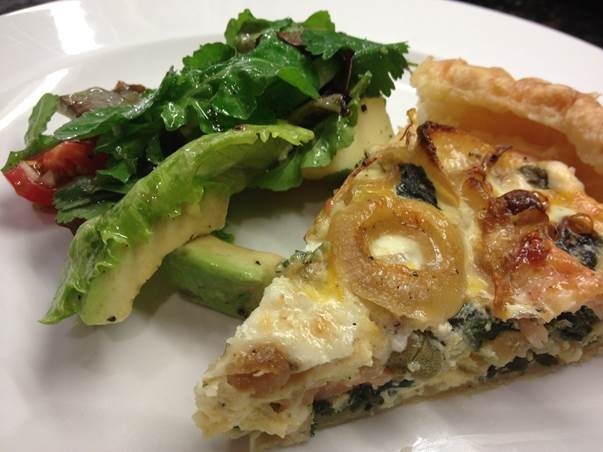 Most recently requested recipes are; Poached Egg on a bed of micro greens served with Carrot frits, Chilli spiced Autumn Pear salad, Smoked salmon & Spinach tart. Place the cornflour and black pepper in a plastic bag, add the carrot frits and toss to cover evenly. Remove carrots from bag, place on a baking sheet and gently toss through with olive oil. Spread out in a single layer and bake in the oven for 30-40 minutes until done. To prevent carrots from sticking it is best to turn them halfway through the cooking process. When the carrot frits are cooked, sprinkle with salt. When the carrot frits are ready, place some micro greens on each plate. 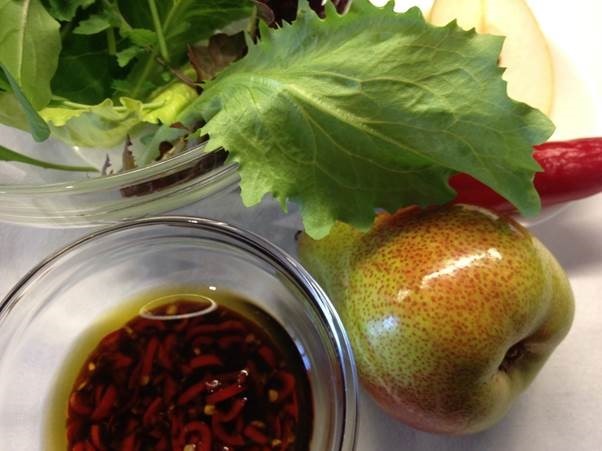 Mix together the balsamic vinegar and walnut oil, drizzle over the micro greens and set aside. Place a small pan on the stove with sufficient water to almost cover the eggs; sprinkle in a little salt, add the eggs and poach gently until cooked to your liking. 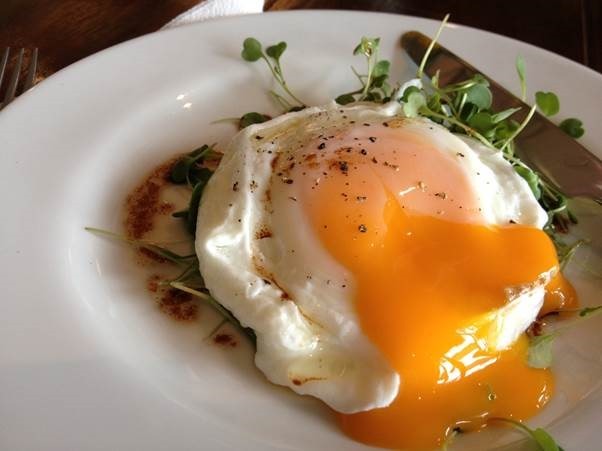 Place a poached egg gently on top of the micro greens, season with a few salt flakes and some ground black pepper. 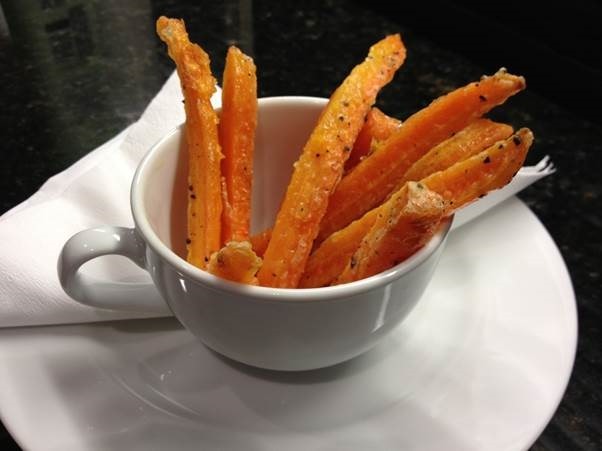 Serve with the carrot frits on the side. The frits are delicious to dunk into the egg. This is nice to serve as a starter or to enjoy as a light lunch. Add the chopped chillies to the oil in a bowl. In a small pan, warm the soy sauce, sugar and vinegar together. Once the sugar has dissolved, whisk it into the olive and chilli mixture. Set aside. 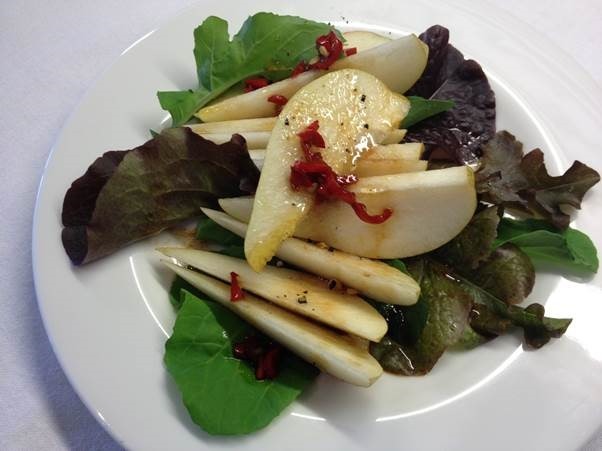 Place some salad greens on each plate, top with some of the sliced pear and drizzle over the dressing, finish with a sprinkle of salt flakes and ground black pepper. Serve. You will need a 25cm loose bottom tart tin, about 4cm deep. Roll out the ready-made puff pastry and line the tart tin – set aside. In the same pan drizzle a little more oil and add the onion; Sauté until soft and translucent. Set aside to cool. Scatter the spinach over the base of the pastry, followed by the onions and then the salmon, torn into strips, then the capers and the feta. In a bowl mix together the eggs and milk; season with salt and pepper, keep in mind the saltiness of the salmon, feta and capers. Pour the egg mixture over the ingredients in the tart tin. Place the tart tin on a tray and set on the middle rack of the oven and bake for about 45 minutes. Smoked salmon is always useful to serve as either as a starter or light lunch and is one of the staples in my fridge. 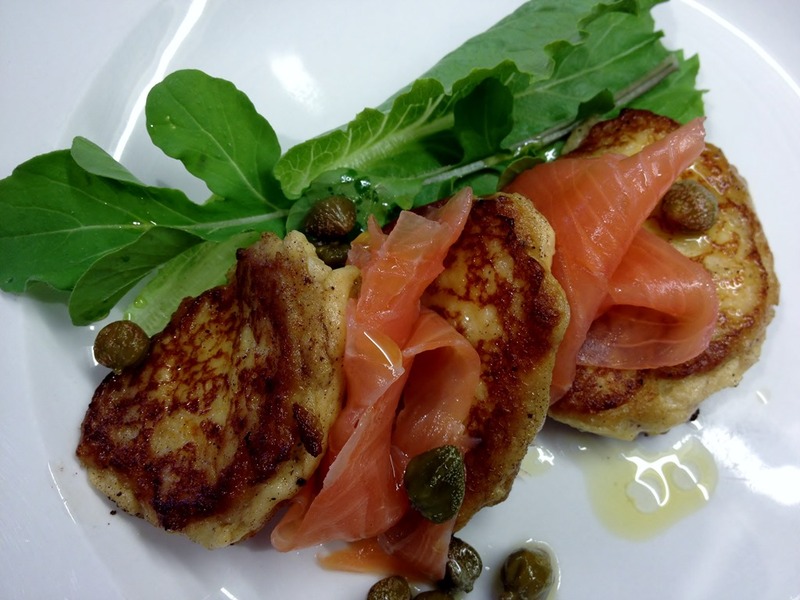 In this recipe I have paired smoked salmon with little potato blinis and drizzled with a refreshing caper and lemon vinaigrette. Place the potatoes in a pot, add sufficient water to cover the potatoes by about 2 ½ cm. add the salt and boil until the potatoes are soft, about 12 minutes. Drain and let cool slightly. Pass the potatoes through a food mill or use a potato masher to crush the potatoes. Sprinkle the potatoes with flour, Parmesan cheese, salt and pepper. Mix together gently with a fork, then add the cream and mix until incorporated. Add the slightly beaten egg to the mixture and blend until incorporated. Place a frying pan over high heat; when hot add one tablespoon of butter and 1 tablespoon of olive oil to the pan, and once melted reduce the heat to medium. Next drop tablespoons of the potato mixture into the pan and cook the blinis for about 2-3 minutes on each side until golden brown. Once the blinis are nicely cooked, transfer to a plate. Depending on the size of your pan, you may need to cook them in batches. 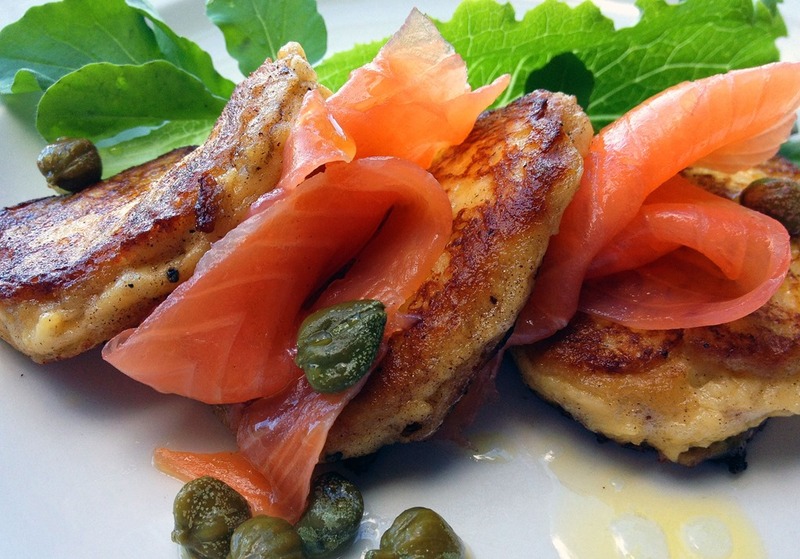 Place some rocket and lettuce on each plate; place a blinis, followed by some smoked salmon, then another blini, more smoked salmon and end with a blini. Drizzle over the caper lemon vinaigrette and serve. 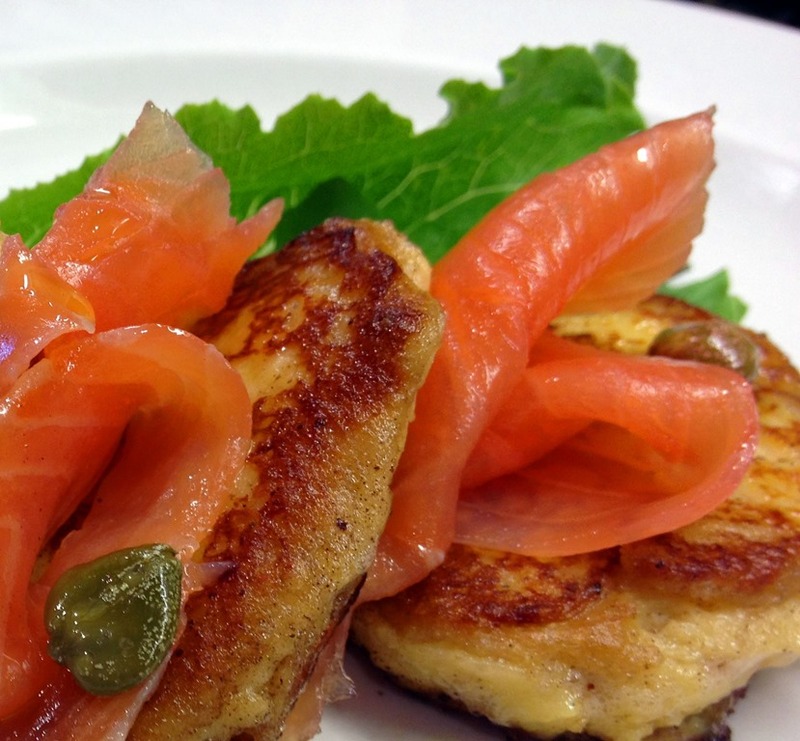 Whisk all the ingredients together until well blended, drizzle over the smoked salmon and potato blinis. When one manages to find good organic products it is a bit like finding your own gold deposit. Every two weeks I receive a delivery of good organic meat from Simply Wholesome and or Go Go’s; the selection which may range from good strong heavy boned chickens to a leg of young goat, eggs, butter, organic wine and whatever new products they may have managed to source, which I am always keen to try. The chicken produced a fantastic roast, good flavour, and being so large also provided sufficient meat for a chicken pie, this was served together with the Clifton Kitchen Greek style salad. 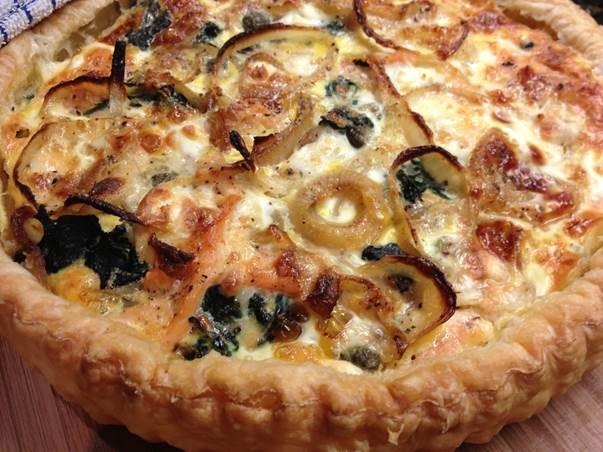 If you have some puff pastry in the deep freeze, to make this pie is quick and easy. Set the oven to 180C. 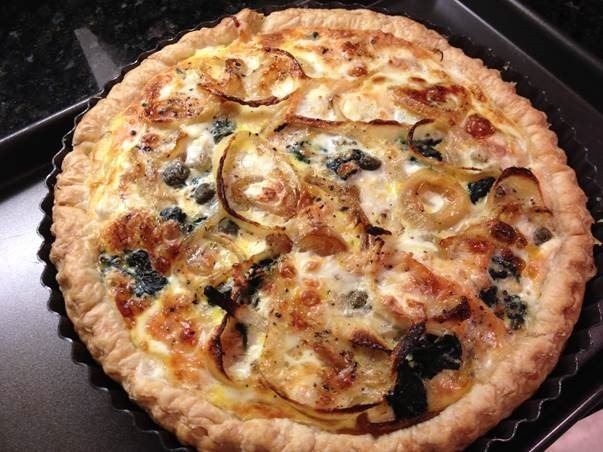 Roll the puff pastry to line a 20cm loose bottom tart or quiche tin. Using a fork, lightly prick the base all over, insert some baking paper and top with baking marbles or beans. Bake for 10 minutes, remove the baking marbles and return to the oven for 5 more minutes, remove and set to one side while you prepare the filling. In a pan sauté the onions in some olive oil until translucent, add the garlic and Thyme and sauté for a few about 5 more minutes, remove from pan to a dish. To the same pan add the mushrooms and sauté until the liquid produced by the mushrooms, has evaporated and the mushrooms are golden brown. Add the sherry and cook for a few more minutes. Add mushrooms to onion mix and season, add the diced chicken. In a bowl mix together the eggs, milk and cream, season lightly then pour mixture over the filling and incorporate well. Pour filling into pre-cooked tart base. Bake for about 35-45 minutes, by which time the custard should be just set. This is an elegant salad bursting with full flavours of cheese, olives and fresh ingredients. In a bowl combine the cucumber, tomato, radishes, onion and green pepper. Scatter over the olives, capers, feta and oregano. Drizzle over the olive oil and vinegars; toss well to coat all of the ingredients. Season with salt and pepper as needed, serve. All text & photos © Kate Abbott. All rights reserved.